For other uses, see Holy Land (disambiguation). Map of the Holy Land, Pietro Vesconte, 1321. Described by Adolf Erik Nordenskiöld as "the first non-Ptolemaic map of a definite country". The Holy Land (Hebrew: אֶרֶץ הַקּוֹדֶשׁ Eretz HaKodesh, Latin: Terra Sancta; Arabic: الأرض المقدسة Al-Arḍ Al-Muqaddasah or الديار المقدسة Ad-Diyar Al-Muqaddasah) is an area roughly located between the Jordan River and the Mediterranean Sea that also includes the Eastern Bank of the Jordan River. Traditionally, it is synonymous both with the biblical Land of Israel and with the region of Palestine. The term "Holy Land" usually refers to a territory roughly corresponding to the modern State of Israel, the Palestinian territories, western Jordan, and parts of southern Lebanon and of southwestern Syria. Jews, Christians, and Muslims all regard it as holy. Part of the significance of the land stems from the religious significance of Jerusalem (the holiest city to Judaism), as the historical region of Jesus' ministry, and as the site of the Isra and Mi'raj event of c. 621 CE in Islam. 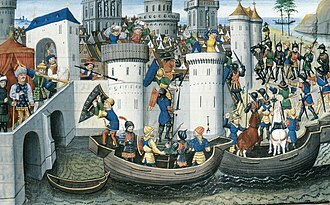 The holiness of the land as a destination of Christian pilgrimage contributed to launching the Crusades, as European Christians sought to win back the Holy Land from the Muslims, who had conquered it from the Christian Byzantine Empire in the 630s. 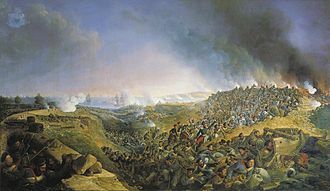 In the 19th century, the Holy Land became the subject of diplomatic wrangling as the Holy Places played a role in the Eastern Question which led to the Crimean War in the 1850s. 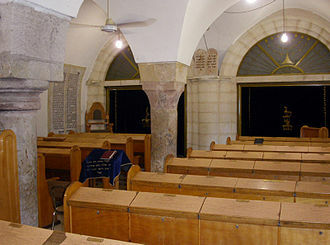 Many sites in the Holy Land have long been pilgrimage destinations for adherents of the Abrahamic religions, including Jews, Christians, Muslims, and Bahá'ís. Pilgrims visit the Holy Land to touch and see physical manifestations of their faith, to confirm their beliefs in the holy context with collective excitation, and to connect personally to the Holy Land. Olives trees, like this one in Qefin, have intrinsic holiness in Judaism, especially during the Sabbatical Year. This "seventh year holiness" carries with it many religious laws. Jews do not commonly refer to the Land of Israel as "Holy Land" (Hebrew: אֶרֶץ הַקוֹדֵשׁ Eretz HaKodesh). The Tanakh explicitly refers to it as "holy land" in only one passage. 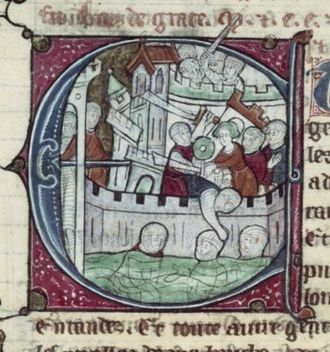 The term "holy land" is further used twice in the deuterocanonical books. 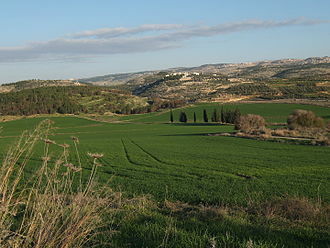 The holiness of the Land of Israel is generally implied in the Tanakh by the Land being given to the Israelites by God, that is, it is the "promised land", an integral part of God's covenant. In the Torah, many mitzvot commanded to the Israelites can only be performed in the Land of Israel, which serves to differentiate it from other lands. For example, in the Land of Israel, "no land shall be sold permanently" (Lev 25:23). Shmita is only observed with respect to the Land of Israel, and the observance of many holy days is different, as an extra day is observed in the Jewish diaspora. The uniqueness of the Land of Israel is...'geo-theological' and not merely climatic. This is the land which faces the entrance of the spiritual world, that sphere of existence that lies beyond the physical world known to us through our senses. This is the key to the land's unique status with regard to prophecy and prayer, and also with regard to the commandments. From the perspective of the 1906 Jewish Encyclopedia, the holiness of Israel had been concentrated since the sixteenth century, especially for burial, in the "Four Holy Cities": Jerusalem, Hebron, Safed and Tiberias – as Judaism's holiest cities. 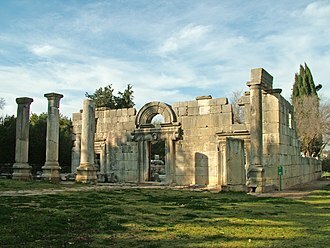 Jerusalem, as the site of the Temple, is considered especially significant. Sacred burials are still undertaken for diaspora Jews who wish to lie buried in the holy soil of Israel. According to Jewish tradition, Jerusalem is Mount Moriah, the location of the binding of Isaac. The Hebrew Bible mentions the name "Jerusalem" 669 times, often because many mitzvot can only be performed within its environs. The name "Zion", which usually refers to Jerusalem, but sometimes the Land of Israel, appears in the Hebrew Bible 154 times. The Talmud mentions the religious duty of colonising Israel. So significant in Judaism is the act of purchasing land in Israel, the Talmud allows for the lifting of certain religious restrictions of Sabbath observance to further its acquisition and settlement. Rabbi Johanan said that "Whoever walks four cubits in [the Land of Israel] is guaranteed entrance to the World to Come". 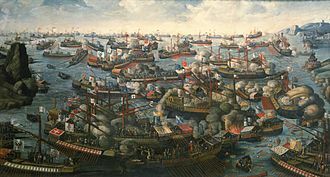 A story says that when R. Eleazar b. Shammua' and R. Johanan HaSandlar left Israel to study from R. Judah ben Bathyra, they only managed to reach Sidon when "the thought of the sanctity of Palestine overcame their resolution, and they shed tears, rent their garments, and turned back". Due to the Jewish population being concentrated in Israel, emigration was generally prevented, which resulted in a limiting of the amount of space available for Jewish learning. However, after suffering persecutions in Israel for centuries after the destruction of the Temple, Rabbis who had found it very difficult to retain their position moved to Babylon, which offered them better protection. Many Jews wanted Israel to be the place where they died, in order to be buried there. The sage Rabbi Anan said "To be buried in Israel is like being buried under the altar." The saying "His land will absolve His people" implies that burial in Israel will cause one to be absolved of all one's sins. For Christians, the Land of Israel is considered holy because of its association with the birth, ministry, crucifixion and resurrection of Jesus, whom Christians regard as the Savior or Messiah, and because it is the land of the Jewish people (according to the Bible). Christian books, including editions of the Bible, often had maps of the Holy Land (considered to be Galilee, Samaria, and Judea). For instance, the Itinerarium Sacrae Scripturae (lit. Travel book through Holy Scripture) of Heinrich Bünting (1545–1606), a German Protestant pastor, featured such a map. His book was very popular, and it provided "the most complete available summary of biblical geography and described the geography of the Holy Land by tracing the travels of major figures from the Old and New testaments." As a geographic term, the description "Holy Land" loosely encompasses modern-day Israel, the Palestinian territories, Lebanon, western Jordan and south-western Syria. 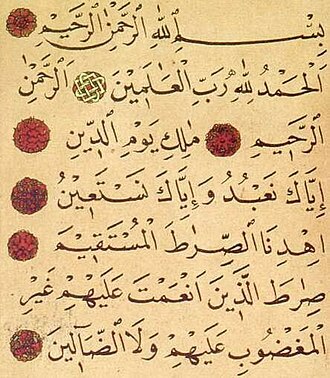 In the Qur'an, the term Al-Ard Al-Muqaddasah (Arabic: الأرض المقدسة‎, English: "Holy Land") is used in a passage about Musa (Moses) proclaiming to the Children of Israel: "O my people! Enter the holy land which Allah hath assigned unto you, and turn not back ignominiously, for then will ye be overthrown, to your own ruin. "[Quran 5:21] The Quran also refers to the land as being 'Blessed'. Jerusalem (referred to as Al-Quds, Arabic: الـقُـدس‎, "The Holy") has particular significance in Islam. The Quran refers to Muhammad's experiencing the Isra and Mi'raj as "a Journey by night from Al-Masjidil-Haram to Al-Masjidil-Aqsa, whose precincts We did bless ...". [Quran 17:1] Ahadith infer that the "Farthest Masjid" is in Al-Quds; for example, as narrated by Abu Hurairah: "On the night journey of the Apostle of Allah, two cups, one containing wine and the other containing milk, were presented to him at Al-Quds (Jerusalem). He looked at them and took the cup of milk. Angel Gabriel said, 'Praise be to Allah, who guided you to Al-Fitrah (the right path); if you had taken (the cup of) wine, your Ummah would have gone astray'." However, some modern scholars argue that the 'Farthest Mosque' was a building or prayer-site just outside Medina. 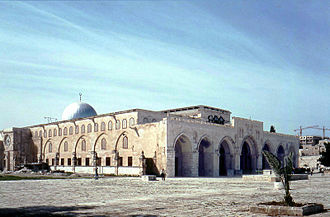 The present building of Al-Masjid Al-Aqsa in Jerusalem had not been built in Muhammad's day, and the Quran does not contain any other reference to Jerusalem, apart from the reference to the change of the Qiblah from Jerusalem to Mecca. Jerusalem was Islam's first Qiblah (direction of prayer) in Muhammad's lifetime, however, this was later changed to the Kaaba in the Hijazi city of Mecca, following a revelation to Muhammad by the Archangel Jibril, by which it is understood by scholars[who?] that it was in answer to the rejection by the Jews of Muhammed's prophetship. The exact region referred to as being 'blessed' in the Qur'an, in verses like 17:1, 21:71 and 34:18, has been interpreted differently by various scholars. 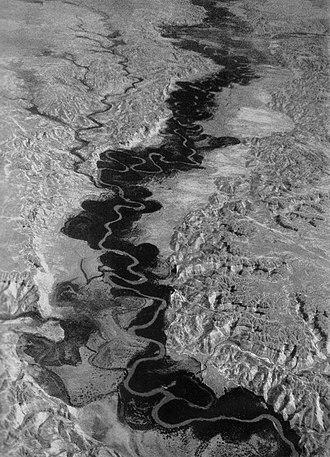 Abdullah Yusuf Ali likens it to a wide land-range including Syria and Lebanon, especially the cities of Tyre and Sidon; Az-Zujaj describes it as, "Damascus, Palestine, and a bit of Jordan"; Muadh ibn Jabal as, "the area between al-Arish and the Euphrates"; and Ibn Abbas as, "the land of Jericho". This overall region is referred to as "Ash-Shām" (Arabic: الـشَّـام‎). Bahá'ís consider Acre and Haifa sacred as Bahá'u'lláh, the founder of the Bahá'í Faith, was exiled to the prison of Acre from 1868 and spent his life in its surroundings until his death in 1892. In his writings he set the slope of Mount Carmel to host the Shrine of the Báb which his appointed successor `Abdu'l-Bahá erected in 1909 as a beginning of the terraced gardens there. The Head of the religion after him, Shoghi Effendi, began building other structures and the Universal House of Justice continued the work until the Bahá'í World Centre was brought to its current state as the spiritual and administrative centre of the religion. Its gardens are highly popular places to visit and Mohsen Makhmalbaf's 2012 film The Gardener featured them. 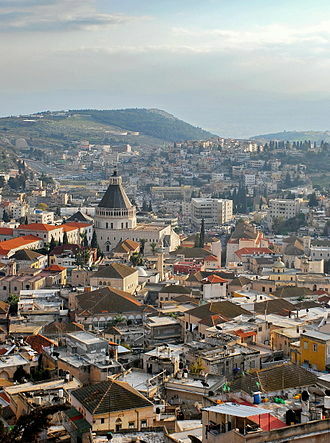 The holiest places currently for Bahá'í pilgrimage are the Shrine of Bahá'u'lláh in Acre and the Shrine of the Báb in Haifa which are UNESCO World Heritage Sites. ^ Harris, David (2005). "Functionalism". Key Concepts in Leisure Studies. SAGE Key Concepts series (reprint ed.). London: SAGE. p. 117. ISBN 9780761970576. Retrieved 9 Mar 2019. Tourism frequently deploys metaphors such [as] pilgrimage [...] Religious ceremonies reinforce social bonds between believers in the form of rituals, and in their ecstatic early forms, they produced a worship of the social, using social processes ('collective excitation'). ^ a b Michael L. Rodkinson (Translator) (2010). The Babylonian Talmud: all 20 volumes (Mobi Classics). MobileReference. p. 2234. ISBN 978-1-60778-618-4. Retrieved 7 December 2011. ^ a b Moshe Gil (1997). 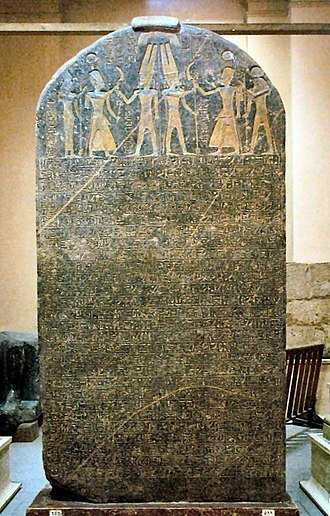 A history of Palestine, 634-1099. Cambridge University Press. p. 632. ISBN 978-0-521-59984-9. Retrieved 7 December 2011. ^ Seasons in Halacha, Pinchos Yehoshua Ellis, pg. 74. ^ The Land of Israel: National Home Or Land of Destiny, By Eliezer Schweid, Translated by Deborah Greniman, Published 1985 Fairleigh Dickinson Univ Press, ISBN 0-8386-3234-3, p.56. ^ Joseph Jacobs, Judah David Eisenstein. "PALESTINE, HOLINESS OF". JewishEncyclopedia.com. Retrieved December 7, 2011. ^ Isaac Herzog (1967). The Main Institutions of Jewish Law: The law of obligations. Soncino Press. p. 51. Retrieved 27 June 2011. ^ Yosef Zahavi (1962). Eretz Israel in rabbinic lore (Midreshei Eretz Israel): an anthology. Tehilla Institute. p. 28. Retrieved 19 June 2011. If one buys a house from a non-Jew in Israel, the title deed may be written for him even on the Sabbath. On the Sabbath!? Is that possible? But as Rava explained, he may order a non-Jew to write it, even though instructing a non-Jew to do a work prohibited to Jews on the Sabbath is forbidden by rabbinic ordination, the rabbis waived their decree on account of the settlement of Palestine. ^ a b c "PALESTINE, HOLINESS OF - JewishEncyclopedia.com". www.jewishencyclopedia.com. Retrieved 2018-10-30. ^ "Why Do Jews Fly Their Dead to Israel for Burial?". www.chabad.org. Retrieved 2018-10-30. ^ a b Bünting, Heinrich (1585). "Description of the Holy Land". World Digital Library (in German). 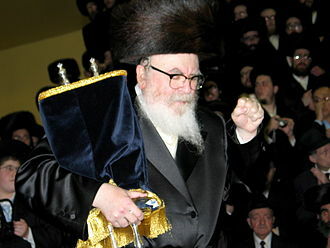 ^ Mordechai Kedar (15 Sep 2008). "The myth of al-Aqsa:Holiness of Jerusalem to Islam has always been politically motivated". Ynetnews. ^ Martin Kramer. "The Jewish Temples: The Temples of Jerusalem in Islam". Jewish Virtual Library. ^ Kamal S. Salibi (2003). A House of Many Mansions: The History of Lebanon Reconsidered. I.B.Tauris. pp. 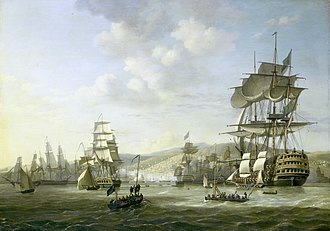 61–62. ISBN 978-1-86064-912-7. To the Arabs, this same territory, which the Romans considered Arabian, formed part of what they called Bilad al-Sham, which was their own name for Syria. From the classical perspective however Syria, including Palestine, formed no more than the western fringes of what was reckoned to be Arabia between the first line of cities and the coast. Since there is no clear dividing line between what are called today the Syrian and Arabian deserts, which actually form one stretch of arid tableland, the classical concept of what actually constituted Syria had more to its credit geographically than the vaguer Arab concept of Syria as Bilad al-Sham. Under the Romans, there was actually a province of Syria. with its capital at Antioch, which carried the name of the territory. Otherwise. down the centuries, Syria like Arabia and Mesopotamia was no more than a geographic expression. In Islamic times, the Arab geographers used the name arabicized as Suriyah, to denote one special region of Bilad al-Sham, which was the middle section of the valley of the Orontes river, in the vicinity of the towns of Homs and Hama. They also noted that it was an old name for the whole of Bilad al-Sham which had gone out of use. As a geographic expression, however, the name Syria survived in its original classical sense in Byzantine and Western European usage, and also in the Syriac literature of some of the Eastern Christian churches, from which it occasionally found its way into Christian Arabic usage. It was only in the nineteenth century that the use of the name was revived in its modern Arabic form, frequently as Suriyya rather than the older Suriyah, to denote the whole of Bilad al-Sham: first of all in the Christian Arabic literature of the period, and under the influence of Western Europe. By the end of that century it had already replaced the name of Bilad al-Sham even in Muslim Arabic usage. ^ Jay D. Gatrella; Noga Collins-Kreinerb (September 2006). "Negotiated space: Tourists, pilgrims, and the Bahá'í terraced gardens in Haifa". Geoforum. 37 (5): 765–778. doi:10.1016/j.geoforum.2006.01.002. ISSN 0016-7185. ^ Smith, Peter (2000). "Arc-buildings of; Bahá'í World Centre". A concise encyclopedia of the Bahá'í Faith. Oxford: Oneworld Publications. pp. 45–46, 71–72. ISBN 978-1-85168-184-6. ^ Leichman, Abigail Klein (7 September 2011). "Israel's top 10 public gardens". Israel21c.org. Retrieved 30 March 2014. ^ Dargis, Mahohla (8 August 2013). "The Cultivation of Belief - 'The Gardener,' Mohsen Makhmalbaf's Inquiry Into Religion". New York Times. Retrieved 30 March 2014. ^ UNESCO World Heritage Centre (2008-07-08). 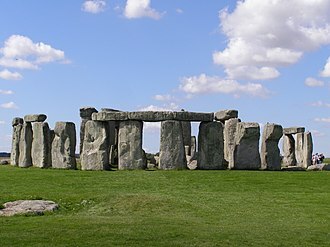 "Three new sites inscribed on UNESCO's World Heritage List". Retrieved 2008-07-08. Wikivoyage has a travel guide for Holy Land. Wikimedia Commons has media related to Holy Land. This article incorporates text from a publication now in the public domain: Singer, Isidore; et al., eds. (1901–1906). "Palestine, Holiness of". The Jewish Encyclopedia. New York: Funk & Wagnalls. The Torah is the central reference of Judaism. It has a range of meanings and it can most specifically mean the first five books of the twenty-four books of the Tanakh, and it usually includes the rabbinic commentaries. 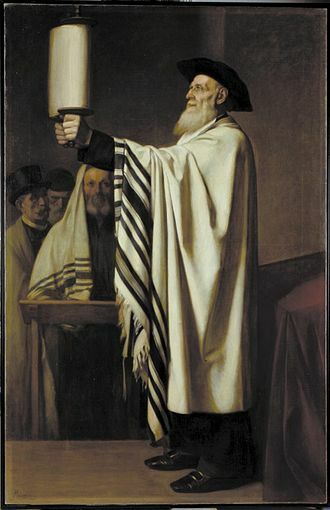 In rabbinic literature the word Torah denotes both the five books and the Oral Torah, the Oral Torah consists of interpretations and amplifications which according to rabbinic tradition have been handed down from generation to generation and are now embodied in the Talmud and Midrash. According to the Midrash, the Torah was created prior to the creation of the world, the words of the Torah are written on a scroll by a scribe in Hebrew. 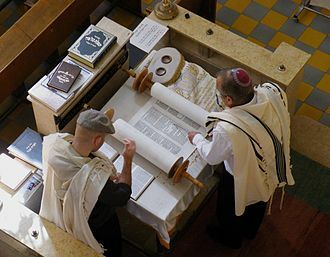 A Torah portion is read publicly at least once every three days in the presence of a congregation, reading the Torah publicly is one of the bases for Jewish communal life. The word Torah in Hebrew is derived from the root ירה, the meaning of the word is therefore teaching, doctrine, or instruction, the commonly accepted law gives a wrong impression. Other translational contexts in the English language include custom, guidance, the earliest name for the first part of the Bible seems to have been The Torah of Moses. This title, however, is neither in the Torah itself. It appears in Joshua and Kings, but it cannot be said to refer there to the entire corpus, in contrast, there is every likelihood that its use in the post-Exilic works was intended to be comprehensive. 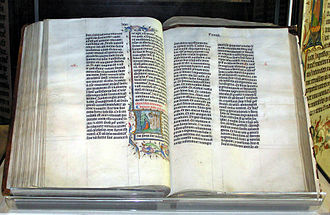 Other early titles were The Book of Moses and The Book of the Torah, Christian scholars usually refer to the first five books of the Hebrew Bible as the Pentateuch, a term first used in the Hellenistic Judaism of Alexandria, meaning five books, or as the Law. The Torah starts from the beginning of Gods creating the world, through the beginnings of the people of Israel, their descent into Egypt, and it ends with the death of Moses, just before the people of Israel cross to the promised land of Canaan. Interspersed in the narrative are the teachings given explicitly or implicitly embedded in the narrative. The Gospel of Luke states that Jesus was about 30 years of age at the start of his ministry. A chronology of Jesus typically has the date of the start of his ministry estimated at around AD 27–29, Jesus Early Galilean ministry begins when after his Baptism, he goes back to Galilee from his time in the Judean desert. The Major Galilean ministry which begins in Matthew 8 includes the commissioning of the Twelve Apostles, the Final Galilean ministry begins after the death of John the Baptist as Jesus prepares to go to Jerusalem. In the Later Judean ministry Jesus starts his journey to Jerusalem through Judea. As Jesus travels towards Jerusalem, in the Later Perean ministry, about one third the way down from the Sea of Galilee along the River Jordan, the Final ministry in Jerusalem is sometimes called the Passion Week and begins with Jesus triumphal entry into Jerusalem. The gospels provide more details about the final ministry than the other periods, the gospel accounts place the beginning of Jesus ministry in the countryside of Roman Judea, near the River Jordan. Jesuss Baptism is generally considered the beginning of his ministry and the Last Supper with his disciples in Jerusalem as the end, some authors consider the period between the Resurrection and the Ascension part of the ministry of Jesus. Luke 3,23 states that Jesus was about 30 years of age at the start of his ministry, there have been different approaches to estimating the date of the start of the ministry of Jesus. In the New Testament, the date of the Last Supper is very close to the date of the crucifixion of Jesus, scholarly estimates for the date of the crucifixion generally fall in the range AD 30-36. The three Synoptic Gospels refer to just one passover during his ministry, while the Gospel of John refers to three passovers, suggesting a period of three years. However, the Synoptic gospels do not require a ministry that lasted one year. The gospels present John the Baptists ministry as the precursor to that of Jesus, John 1,28 specifies the location where John was baptizing as Bethany beyond the Jordan. Certain terms are used very commonly for groups of holidays. 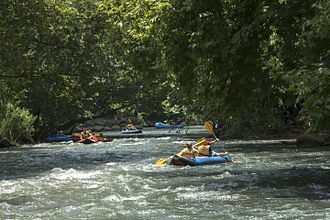 These include the first and seventh days of Passover, Shavuot, by extension, outside the Land of Israel, the second-day holidays known under the rubric Yom tov sheni shel galuyot are included in this grouping. Colloquially, Yom Kippur, a Biblically-mandated date on which even food preparation is prohibited, is included in this grouping. The English-language term High Holy Days refers to Rosh Hashanah and Yom Kippur collectively, the term Three Pilgrimage Festivals refers to Passover and Sukkot. Within this grouping Sukkot normally includes Shemini Atzeret and Simchat Torah, certain terminology is used in referring to different categories of holidays, depending on their source and their nature, Shabbat, or Sabbath, is referred to by that name exclusively. Similarly, Rosh Chodesh is referred to by that name exclusively, plural moadim, refers to any of the Three Pilgrimage Festivals of Passover and Sukkot. When used in comparison to Yom Tov, it refers to Chol HaMoed, Ḥag or chag, plural chagim, can be used whenever yom tov or moed is. It is used to describe Hanukkah and Purim, as well as Yom Haatzmaut, Taanit, or, less commonly, refers to a fast. 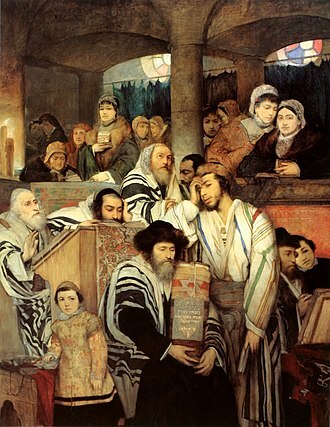 These terms are used to describe the rabbinic fasts, although tzom is used liturgically to refer to Yom Kippur as well. 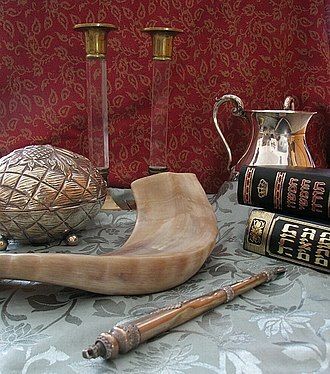 The most notable feature of Shabbat and the Biblical festivals is the requirement to refrain from melacha on these days. Melacha is most commonly translated as work, perhaps a translation is creative-constructive work. 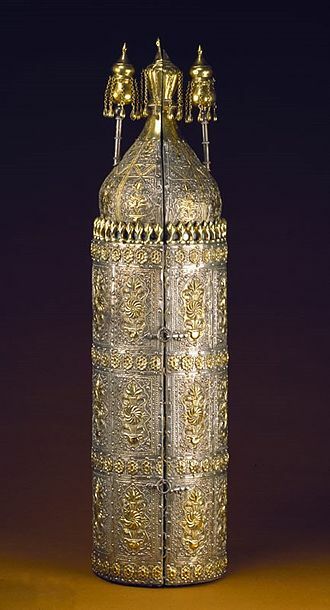 Strictly speaking, Melacha is defined in Jewish law by 39 categories of labor that were used in constructing the Tabernacle while the Jews wandered in the desert, as understood traditionally and in Orthodox Judaism, On Shabbat and Yom Kippur all melacha is prohibited. On a Yom Tov which falls on a weekday, not Shabbat, some melacha related to preparation of food is permitted. On weekdays during Chol HaMoed, melacha is not prohibited per se, melacha should be limited to that required either to enhance the enjoyment of the remainder of the festival or to avoid great financial loss. Christianity has a strong tradition of pilgrimages, both to sites relevant to the New Testament narrative and to sites associated with saints or miracles. The first pilgrimages were made to sites connected with the ministry of Jesus, the Itinerarium Burdigalense, the oldest surviving Christian itinerarium, was written by the anonymous Pilgrim of Bordeaux recounting the stages of a pilgrimage to Jerusalem in the years 333 and 334. 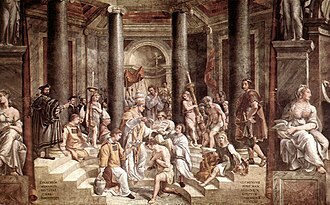 Pilgrimage was encouraged by church fathers like Saint Jerome and established by Helena, pilgrimages began to be made to Rome and other sites associated with the Apostles and Christian martyrs, as well as to places where there have been apparitions of the Virgin Mary. 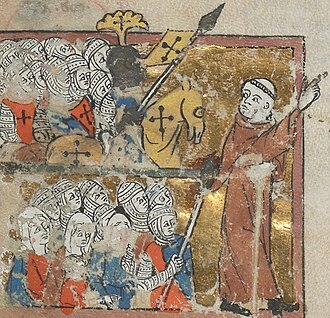 The Seljuk Turks now systematically disrupted Christian pilgrimage routes, which one of the major factors triggering the crusades in the 11th century. Under the Ottoman Empire travel in Palestine was once again restricted, Rome has been a major Christian pilgrimage site since the middle ages. 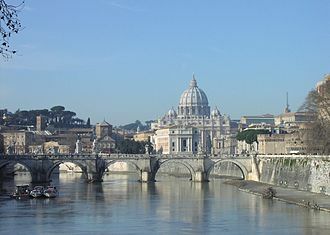 Pilgrimages to Rome can involve visits to a number of sites. The stairs were, brought to Rome by St. Helena in the 4th Century, for centuries, the Scala Santa has attracted Christian pilgrims who wished to honour the Passion of Jesus. Traditionally, pilgrims in Rome visit the seven churches in 24 hours. This custom, mandatory for each pilgrim in the Middle Ages, was codified in the 16th century by Saint Philip Neri. The seven churches are the four major Basilicas, while the three are San Lorenzo fuori le mura, Santa Croce in Gerusalemme and San Sebastiano fuori le mura. At some point between 818 and 842, during the reign of Alfonso II of Asturias, bishop Theodemar of Iria claimed to have some remains which were attributed to Saint James the Greater. Around the place of the discovery a new settlement and centre of pilgrimage emerged, which was known to the author Usuard in 865, santiago would become in the course of the following century a main Catholic shrine second only to Rome and Jerusalem. In the 12th century, under the impulse of bishop Diego Gelmírez, Compostela became an archbishopric, attracting a large, marian apparitions are responsible for tens of millions of Christian pilgrimages worldwide. Holy places, are sites that a religion considers to be of special religious significance. They are usually visited by pilgrims. Located in Bahji near Acre, the Shrine of Baháulláh is the most holy place for Baháís and their Qiblih and it contains the remains of Baháulláh, founder of the Baháí Faith and is near the spot where he died in the Mansion of Bahjí. The second holiest site is the Shrine of the Báb in Haifa, in Iran, the Bahais possessed several important holy sites, including the House of the Bab in Shiraz, the House of Baha Allahs father in Tehran, the shrine and grave of Quddus. Since the Revolution, all places have been demolished. The Buddha is said to have identified four sites most worthy of pilgrimage for Buddhists, India, is where the Buddha attained Parinirvana after his death. Lumbini, Nepal, is where Queen Maya gave birth to Prince Siddhartha Gautama, India, is the deer park where the Buddha first taught the Dhamma after realizing enlightenment. Sravasti is the place where Buddha spent the largest amount of time, Place of the subduing of Nalagiri, the angry elephant, through friendliness. Rajgir was another city of ancient India. Sankassa, Place of the descending to earth from Tusita heaven, Place of receiving an offering of honey from a monkey. Vaishali was the capital of the Vajjian Republic of ancient India, lhasa in Tibet contains many culturally significant Tibetan Buddhist sites such as the Potala Palace, Jokhang temple and Norbulingka palaces. In Christianity, the Holy places are significant because they are the place of birth, ministry and Resurrection of Jesus of Nazareth and it contains the Church of the Holy Sepulchre, Via Dolorosa, Mount Zion and the Dormition Abbey, and Gethsemane. Nazareth is Jesuss hometown and the site of holy places, including the Church of the Annunciation. Bethlehem is the birthplace of Jesus, qana is where Jesus made his first miracle Al-Maghtas, this site has been recognized as the original site where Jesus was baptized by all the major traditional Christian Churches. The site is in Jordan Machaerus, the Herodias fortress where John the Baptist was imprisoned and beheaded, the site is in Jordan Mount Nebo, traditional site of the death of Moses and where he looked over to the promised land. The city of Jerusalem is significant in a number of religious traditions, including the Abrahamic religions Judaism and Islam, which consider it a holy city. 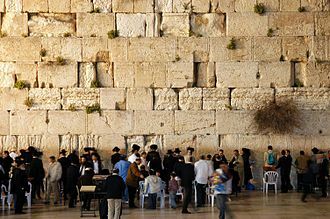 Some of the most sacred places for each of these religions are found in Jerusalem, Jerusalem has been the holiest city in Judaism and the ancestral and spiritual homeland of the Jewish people since the 10th century BCE. During classical antiquity, Jerusalem was considered the center of the world, the city of Jerusalem is given special status in Jewish religious law. In particular, Jews outside Jerusalem pray facing its direction, any expansion of the city for these purposes must be approved by the Sanhedrin. Also, when the Temple in Jerusalem was standing, Jerusalem observed special laws regarding the Four Species on Sukkot, Jerusalem has long been embedded into Jewish religious consciousness. Jews have studied and personalized the struggle by King David to capture Jerusalem and his desire to build the Jewish temple there, as described in the Book of Samuel, many of King Davids yearnings about Jerusalem have been adapted into popular prayers and songs. Jerusalem appears in the Tanakh 669 times and Zion appears 154 times, the Tanakh, is a text sacred to both Judaism and Christianity. In Judaism it is considered the Written Law, the basis for the Oral Law studied and treasured by Jews, the Talmud elaborates in great depth the Jewish connection with the city. When the Babylonians captured the city in 580 BC, they destroyed the temple and that is, all worshiping was practiced in the temple and only the temple. From the Babylonian capture, Judaism was codified, the Tanakh laid the foundation for both Christianity and Islam. In Christian tradition, Jerusalems place in the life of Jesus gives it great importance, Jerusalem is the place where Jesus was brought as a child, to be presented at the Temple and to attend festivals. According to the Gospels, Jesus preached and healed in Jerusalem, there is an account of Jesus cleansing of the Temple, chasing various traders out of the sacred precincts. The earliest Christians were outcast and used the symbol to recognize one another to avoid being killed or reprimanded for being Christian by Roman rule. Hebron is a Palestinian city located in the southern West Bank,30 km south of Jerusalem. Nestled in the Judaean Mountains, it lies 930 meters above sea level, the city is divided into two sectors, H1, controlled by the Palestinian Authority and H2, roughly 20% of the city, administered by Israel. All security arrangements and travel permits for local residents are coordinated between the Palestinian Authority and Israel via military administration of the West Bank, the settlers are governed by their own municipal body, the Committee of the Jewish Community of Hebron. In Judaism it is considered the second-holiest city after Jerusalem, while Islam regards it as one of the four holy cities. Hebron is a hub of West Bank trade, responsible for roughly a third of the areas gross domestic product. It is locally known for its grapes, limestone, pottery workshops and glassblowing factories. The old city of Hebron is characterized by narrow, winding streets, flat-roofed stone houses, the city is home to Hebron University and the Palestine Polytechnic University. Hebron is attached to cities of ad-Dhahiriya, Yatta, Hebron Governorate is the largest Palestinian governorate with its population of 600,364. The name Hebron traces back to two Semitic roots, which coalesce in the form ḥbr, having reflexes in Hebrew and Amorite and denoting a range of meanings from colleague, in the proper name Hebron, the original sense may have been alliance. The Arabic term derives from the Quranic epithet for Abraham, Khalil al-Rahman Beloved of the Merciful or Friend of God, Arabic Al-Khalil thus precisely translates the ancient Hebrew toponym Ḥebron, understood as ḥaber. Archaeological excavations reveal traces of strong fortifications dated to the Early Bronze Age, the city flourished in the 17th–18th centuries BCE before being destroyed by fire, and was resettled in the late Middle Bronze Age. This older Hebron was originally a Canaanite royal city, abrahamic legend associates the city with the Hittites. 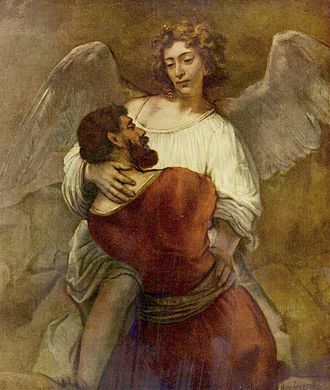 In Biblical lore they are represented as descendants of the Nephilim, in settling here, Abraham is described as making his first covenant, an alliance with two local Amorite clans who became his ba’alei brit or masters of the covenant. Walking on water, by Veneziano, 1370. The Mahabodhi Temple is an important Buddhist pilgrimage site. The Church of the Holy Sepulchre is one of the most important pilgrimage sites in Christianity. 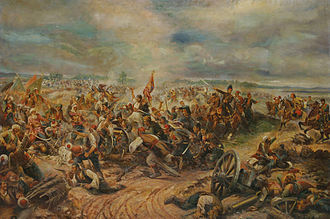 The Battle of Vassilika in 1821 marked an early turning point in the war. Dresden Frauenkirche, Lutheran church of Dresden.